Today’s financial services environment is characterized by change. The drivers of change include consumers, technology, and delivery systems. Moreover, financial institutions must change with these elements to remain relevant and competitive in today’s omni-channel economy. In addition, balancing service to younger and older segments and their preferences for how service is delivered will define success for the financial institution in the future – and keep in mind, that the customer is the judge of service quality. One of the biggest questions that we hear is, “How do branches maintain their relevance in an increasingly technological age?” Surveys underscore that 60 – 80% of new banking relationships are established through the branch network. Furthermore, a recent Ernst & Young study says 65% of sales occur in a physical location i.e. a branch. However, once the relationships are made, regardless of the financial institution’s size, customers migrate through a variety of delivery channels, with each customer seeking his or her most comfortable and effective method of interacting with the institution. So…how does the branch fit today and tomorrow? What we are describing is the distribution system that financial institutions will employ tomorrow (that is, if they haven’t already started) – the omni­-channel distribution network. This network combines automated, physical, and virtual channels into a flexible, and consistent branded customer experience. Furthermore, the physical branch synchronizes these channels by establishing customer expectations and the institution’s brand image in the market. It’s always on. The automated channel includes the institution’s ATMs and Interactive Teller Machines (ITMs). These channels are often self-service or assisted service and can operate 24/7/365, locally. The virtual channels include the phone system, web-based, and mobile platforms. These channels may be self-service or offer some level of assistance and operate 24/7/365…globally. In the omni­-channel network, the physical channel contributes to service density by providing visibility, accessibility, and the institution’s full range of products and services. As always, convenience is a driver in the consumer’s choice of financial institution. Remember…65% of consumer sales occur in a physical branch. So, convenience is aligned with a habitual consumer commuting pattern between where individuals live, work, and shop. The branch must find its purpose. As the retail branch evolves, it will be developed with a specific target market and “business case” as the motivation. Branches will have a reduced footprint, scaled to meet market and customer demands and styled to match those same preferences. Space within the branch will be open and flexible to facilitate change as needed to respond to changing market conditions. Finally, the self service branch is fully automated and heavily branded and has no employees. You can imagine a full service ATM installation or, more likely in today’s economy, an ITM creating an outpost of service for customers with extended hours capability. Although the role of the branch is changing, retail branches remain an important element in an institution’s omni­-channel delivery strategy. As financial institutions evaluate their current networks or contemplate new branches for branch transformation, they must be keenly aware of the market they intend to serve and the business case that supports the decision. In the future, branches will be smaller and will focus on customer service and sale of more sophisticated products and services. The branch will work in a hub and spoke relationship with a variety of other delivery channels to offer the customer a wide variety of access points to the institution to deepen wallet share and long term stickiness with the institution. In the omni-channel network, the branch plays a different ­and even more valuable­ role than ever – providing connection with the customer and community. Sometimes stories bring new ideas into focus. 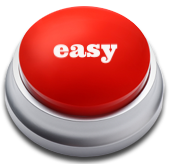 We have an easy button for that!